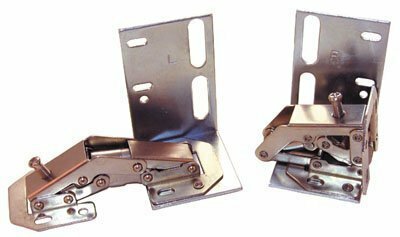 Steel Sink Front Tip-Out Tray Hinges (Pair). Adjustable hold-out feature. Hinge is concealed when front is closed. Easy screwdriver adjustment. 32mm compatible. No mounting holes in base. Screws NOT included Dimensions: 1-3/4" D x 1-7/8" W x 2-13/16" H. Finish: Nickel. If you have any questions about this product by Feeny, contact us by completing and submitting the form below. If you are looking for a specif part number, please include it with your message.